There's a case to be made for whether or not the cost of gaming is getting out of hand, yet if you can afford the very best that the industry has to offer, there's plenty to whet your appetite in late 2018. Intel will soon be introducing its 9th Gen Core processor and Nvidia has raised the bar for graphics with the launch of the GeForce RTX 2080 Ti. Offering in some cases a performance uplift of 40 per cent over the last-generation GTX 1080 Ti, the RTX successor now stands alone as the performance king, making it the one-and-only choice for enthusiasts with deep pockets. And deep they must be, as performance supremacy brings with it the ability to set pricing accordingly. Nvidia has settled on £1,099 for the beautifully crafted Founders Edition, and custom partner cards can fetch up to £1,300 depending on model. A huge chunk of change, but if you're in the market for an ultra-high-end gaming rig, this is the GPU you want. The question for enthusiasts is should you buy the Founders Edition or a custom-cooled derivative from one of Nvidia's add-in-board partners? In the past, throttling issues on FE cards simplified the decision, as custom alternatives were significantly faster, cooler and quieter. This time around, Nvidia's Founders Edition has been upgraded with a dual-fan cooler that works well, looks fabulous and sits atop a GPU that has been overclocked as standard. 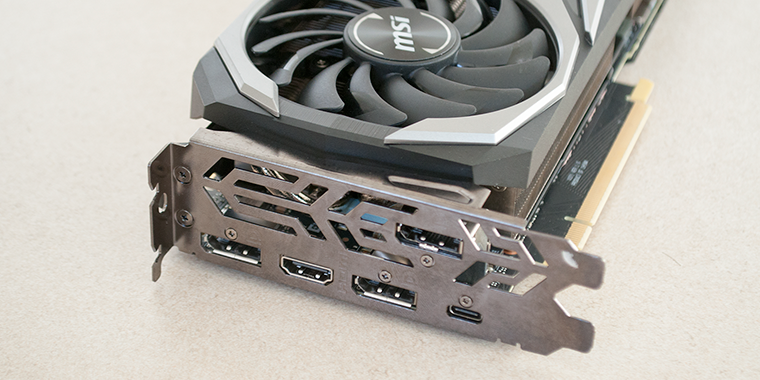 Such a formula negates almost all of the benefits of an AIB card, but MSI knows its way around a GPU and has historically proven adept at delivering a compelling package. 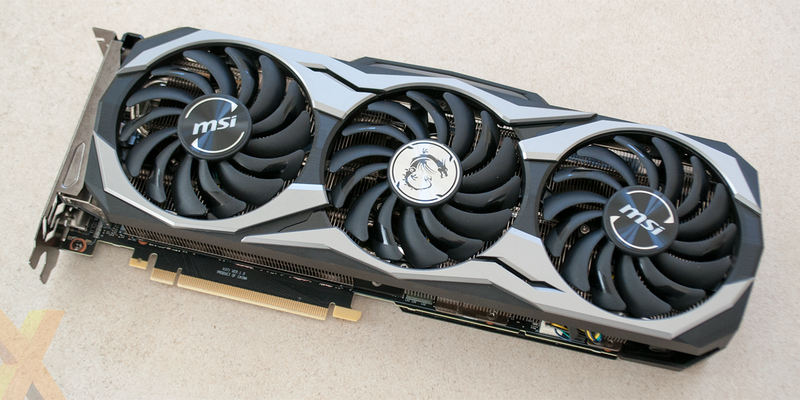 To find out if it can stave off the Founders Edition threat, we're taking a closer look at the RTX 2080 Ti Duke 11G OC, priced at £1,140. The £40 price premium is insignificant in the grand scheme of things, and in return you're getting a huge card measuring 314mm x 120mm x 50mm and weighing 1,243g. Dimensions that spill into a third expansion slot prevent the Duke from being as sleek as the Founders Edition, yet MSI's design is reasonably smart. The black-and-grey colour scheme works well, it has a gamer aesthetic but isn't overly ostentatious, and though the top shroud is mostly plastic, the material is thick enough to prevent any unwanted squeaks or rattles. 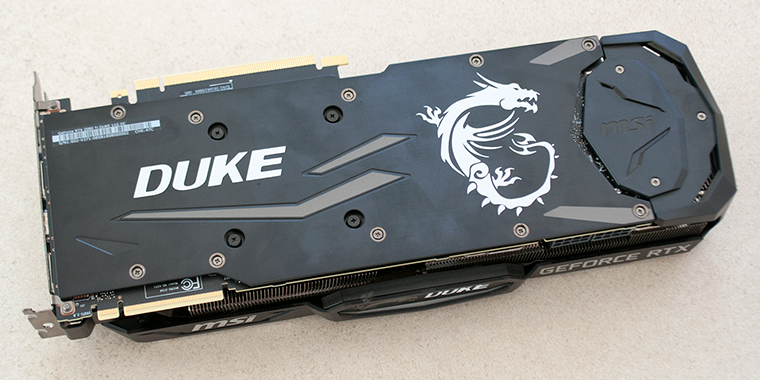 Construction quality is aided by a metal backplate on the rear, a first for a Duke-series card, and the way in which the cooler overhangs the PCB reveals that a reference PCB lies within. We like the fact that MSI has nickel-coated its heatpipes to maintain the overall aesthetic, and the large heatsinks cover all of the vital components. Helping shift the heat are three Torx 2.0 fans, and these switch off when GPU temperature falls below 60ºC to practically eliminate noise when idle. 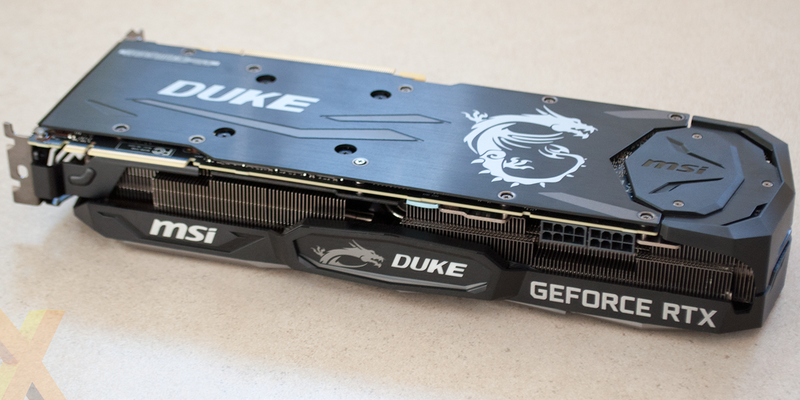 Duke isn't as pretty as the Founders Edition, in our opinion, yet it's a decent-looking card in its own right, and the configurable RGB-backlit logo on the top edge is well implemented. Do note that the dragon logo and Duke lettering are backlit, but the MSI and GeForce RTX branding are not. We found the card rigid enough to withstand obvious sagging in our own test platform, yet if you fear the dreaded droop, you'll appreciate the fact that MSI includes a metal brace as part of the bundle; it fixes to the next two expansion slots and serves as an arm on which the cooler can rest. The sheer size of the design intimates a factory overclock, yet don't expect a major bump. Duke's boost clock is raised by just 30MHz over the Founders Edition, taking it to 1,635MHz, while memory remains at a reference 14Gbps. Hoping for more in terms of frequency? MSI is keeping its highest speeds reserved for other cards in its line-up; spending another £100 would put you into Gaming X Trio territory, where boost clock is ramped-up to 1,755MHz. We don't expect to see any partners meddle with the standard selection of display outputs, as the default arrangement of three DisplayPort 1.4, one HDMI 2.0b and USB Type-C ticks the relevant boxes. The small increase in boost clock suggests that MSI's RTX 2080 Ti Duke 11G OC will supplant the RTX 2080 Ti Founders Edition at the top of our charts, but the £40 premium would be better justified by lower temps, reduced noise and a good amount of overclocking headroom. Let's run the benchmarks and see how it all pans out.